Today's guest blog is by Dr. Kiko Bracker, DVM, DACVECC, criticalist-extraordinaire from Angell Animal Medical Center. This blog was previously posted by Angell here. As Angell is where VetGirl did her internship, we need to share the love! 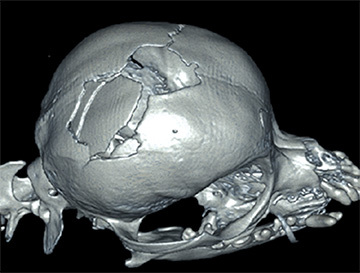 The term traumatic brain injury is now widely used in veterinary critical care and supplants the term head trauma which had been previously used when referring to neurologic dysfunction of the brain due to trauma to the head. Traumatic brain injury is a common injury to dogs and cats and can result from motor vehicular accidents, falls from heights, bite wounds, blunt trauma, etc. • Primary injury is the direct injury to the brain that occurs at the time of contact/trauma. This includes parenchymal tears, vascular tearing and hemorrhage resulting in cerebral contusions, and skull fractures with parenchymal compression [image 1-2]). Most of our treatment for traumatic brain injury in dogs and cats is not directed at reversing the primary brain injury, but rather at minimizing the cerebral metabolic consequences of the primary trauma which is considered secondary brain injury. • Secondary injury is a series of biochemical events that develop minutes to hours after the primary injury and can result in neuronal damage and death. These are local or systemic events. Examples of secondary injury include hypotension, hypo- and hyperglycemia, hypoxia, inflammation, hypercapnia, ischemia, ATP depletion, hyperthermia, increased intracranial pressure, cerebral edema, infection, and the list goes on. 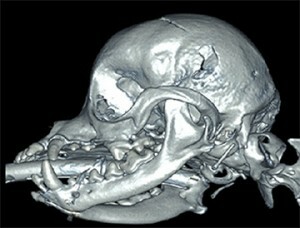 Image 1: This 5yr old female Chihuahua may have been bitten in the head by another dog. A 3-dimentional CT reconstruction of the skull shows a partially displaced skull fracture lateral and caudal to the open fontanelle on the first image, and a smaller depressed skull fracture is noted dorsal to the zygomatic arch on the second image. This patient was managed with no surgical intervention. There are three components within the skull: the brain, cerebral spinal fluid (CSF), and blood. The skull is uniquely developed to protect the brain from damage. However, because the skull’s rigid structure does not permit much distension with increased pressure (graph 1), when any one of the three components within the skull increases in volume/size – the pressure within the skull increases and the other two components get squeezed. This is referred to as the Monro-Kellie doctrine. For instance, if there is hemorrhage into the brain tissue both CSF and blood will be displaced from the skull in order to accommodate the increased volume of the hemorrhage – this results in decreased perfusion and likely increased intracranial pressure. 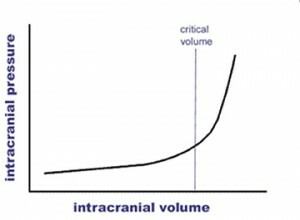 Graph 1: Due to the limited compliance of the skull, only a small amount of increased intracranial volume can be tolerated before a dramatic increase in intracranial pressure results. The healthy brain is uniquely capable of maintaining a normal cerebral blood flow (CBF) over a wide range of mean arterial blood pressures (MAP) from 50 to 150mmHg (see Graph 2). When blood pressure is outside this range or following trauma, the brain loses its ability to auto-regulate blood flow and cerebral blood flow becomes directly dependent on arterial blood pressure. This means that at lower MAP, the brain has poor perfusion and at higher pressures the blood flow to the brain may be excessive. Graph 2: In states of health, cerebral blood flow (CBF) is maintained relatively constant over a wide range of mean arterial pressures. This autoregulation disappears after a traumatic insult to the brain and CBF becomes directly dependent on blood pressure and is no longer able to be kept constant. The main goal of initial management of traumatic brain injury involves maintaining appropriate oxygen delivery (blood flow) to the damaged brain. Fairly straight forward measures can be taken to achieve this end. a. Mannitol 20% (0.5-2.0g/kg over 15-30 minutes) is commonly used to reduce interstitial edema via its hypertonicity to plasma. Additionally, mannitol improves cerebral blood flow by reducing blood viscosity and it scavenges free radicals. Unfortunately, mannitol’s osmotic diuresis results in dehydration from loss of intravascular volume, so that volume needs to be judiciously replaced with IV or enteral fluid. b. Hypertonic saline (HTS) also is hypertonic to plasma and improves cerebral blood flow and reduces interstitial edema. Sodium is avidly resorbed by the kidney so there is no diuresis by administration of this fluid. Different concentrations are available, but 3.0-7.5% is commonly used (2-5ml/kg) and is given over 2-5 minutes. c. Synthetic colloids are often paired with HTS in equal volumes to prolong the duration of effect of the HTS and further expand plasma volume. 2) Maintain blood pressure. Cerebral perfusion pressure is dependent in part on maintaining appropriate blood pressure and blood volume. Patients with hypovolemic shock should be treated with IV crystalloids/colloids to maintain a mean blood pressure of at least 80-100mmHg. Over hydration/resuscitation should be avoided as this can worsen interstitial edema. Vasopressor therapy can certainly be used if other methods of pressure support fail. 3) Treat hypoxia with oxygen. The negative effects of hypoxemia are compounded with brain trauma since cerebral blood flow is usually already compromised. 4) Control pain and prevent excessive panting or vocalization with opioids or benzodiazepines. Panting will result in a drop of blood CO2. Excessively decreased CO2 levels result in cerebral vasoconstriction and decreased blood flow. An end tidal CO2 of about 35-40mmHg is ideal. 5) When recumbent, a patient’s head should be elevated by about 30% to prevent blood pooling in the vessels of the head. Caution should be taken to avoid kinking of the jugular veins. No tight fitting collars or leashes should be used. 6) Hyperglycemia is often associated with worse outcomes, so IV dextrose should not be used unless a patient is hypoglycemic. 7) Furosemide (Lasix) results in dehydration and poor perfusion, so it should not be used. 8) IV steroid therapy should be avoided. Larger human studies have shown poorer outcomes with steroid use in traumatic brain injury. Even patients with apparently severe central neurologic dysfunction can improve given supportive care and enough time. It is common for dramatic improvement to occur in the first 24 hours of therapy, but steady improvement is often seen for several months in some patients, especially juveniles. 3. Head Trauma, by S Platt and N Olby, ch 20. BSAVA Manual of Canine and Feline Neurology, 4th Ed. Eds. S Platt and N Olby. Woodrow House. 2013. It was great to see this bog from my classmate. How often can the mannitol and hypertonic saline be given ?